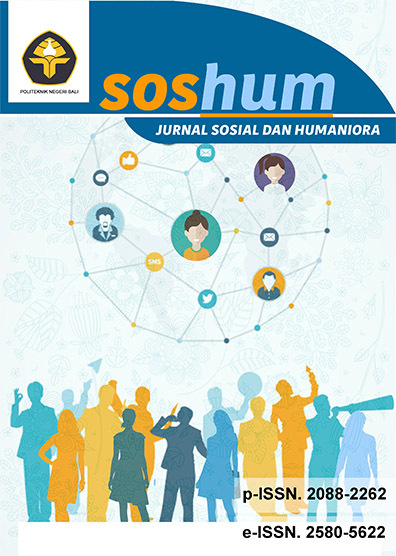 SOSHUM : Jurnal Sosial dan Humaniora [Journal of Social Sciences and Humanities][p-ISSN 2088-2262 | e-ISSN 2580-5622 | DOI 10.31940/soshum] aims to develop itself as a pioneer journal in social sciences and humanities. Starting from the year 2018, it publishes all papers in English. Areas relevant to the scope of the journal include Social Sciences, Education, Media and Communication studies, Humanities, Tourism, Arts and Culture, Linguistics, Literature, Philosophy, and Religious Studies. Research as well as literary study articles submitted to SOSHUM should be original and have never been published anywhere. All submitted articles will be blinded peer-reviewed by panel of experts in the concern field of study. The manuscripts should follow guide line as found in the journal template for the purpose of both reviewing and editing. It is published by the Politeknik Negeri Bali three issues per year: March, July, and November. SOSHUM cordially invites scholars or reserachers of the related disciplines to submit their paper in English for the upcoming edition (Volume 9 No 2, July 2019). Topic of the paper should be related to one of these issues mentioned above.